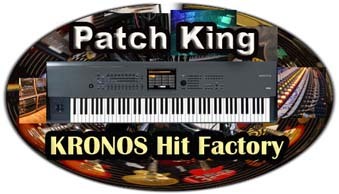 Kronos Hit Factory – 6 Drum Kits, 64 programs, 32 Combis & 100 MB of new multi samples. ONLY $75. USD. Korg Kronos Volume #3 – Hit Factory – Our third collection of sounds for the Kronos HD-1 Sound Engine is now available! An amazing mix of fully KARMA-fied Programs & Combis perfect for producers and keyboard players creating hip hop, R&B, techno, rave, trance, rock, industrial or dance tracks. Hit Factory includes SIX AMAZING NEW DRUM KITS with hundreds of new samples that are guaranteed to get your head noddin with some of the coolest beats found anywhere. The new drum kits contain the best of our classic drum samples from the Patch King sample city vault. Also included are a wide mix of funk guitars, orchestra and horn hits, noises, scratches, human beat boxes, analog vocoders and new voice samples. All programs and combis include full KARMA functions and drum track as well as control assignments to the Kronos Joystick, Vector Stick, SW1 & SW2 and User Knobs 4-8. Korg Kronos SOUND BUNDLE PACK: Get all three of our incredible Kronos sound sets for only $200. An amazing collection of sounds now available for the Korg Kronos – weighing in at: 192 Programs, 96 Combis, 6 Drum Kits and over 400 MB of New Samples! Get the complete package of Vintage Synths, Soundtrack Mix and Hit Factory for the special low price of $200. USD – A $25. savings.